The Alien has landed!! I can't express how happy I am with the outcome of this grow, These are hands down the best free beans I have ever had the pleasure of growing! Top quality genetics and a little TLC produced this big, beautiful lady. It was an easy grow from start to finish, never really had any issues with this one that I can think of, maybe a little light bleaching at one point, but it never really slowed her down. I'm on the fence with Rhizotonic, I don't see a huge difference using as opposed to not. I know a lot of people swear by it, by I'm not seeing it. Love the Terpinator!! A staple product on my nutrients shelf. This will be one of my last grows with Remo for a bit, No problems with the products, just want to try some different nutes. Remo has served me well. Seemed to help produce some nice sized colas. Going to keep experimenting with it. This will be the last grow with Bud Blaster for a bit. It's all gone and I have a bunch of other PK boosters to try out. 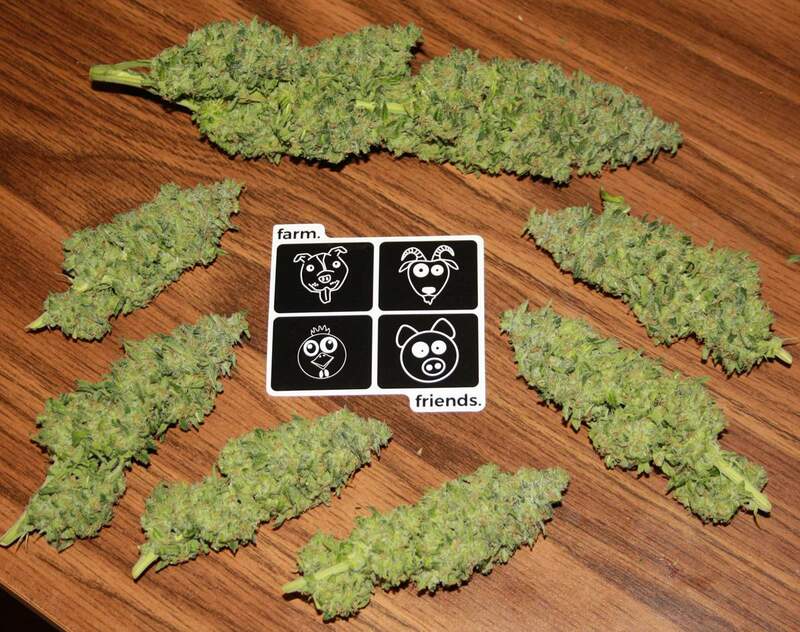 I liked the product, it helped produce nice buds for sure. Will buy again when in need. I think I won this round of Squirrel vs Alien vs Triangle, stay tuned for Round 2 coming soon! Can't say enough good about my first Mephisto experience. Very easy plant to grow. I basically let her go wild, only a bit of defoliating down under and she turned into a beast. She has a very unique smell of green peppers and spice or something. I can't nail it... hoping the terpines shine through in the finished product and I can nail the profile in my smoke report. Really looking forward to sampling a little bit and seeing what the final outcome is. Thanks to all who followed along and checked in regularly... Stay tuned for dry weight and smoke report. Update: Ended up with a respectable 101g dried bud and just shy of an ounce of trim... Enough for a pound of budder. The buds need to cure for a bit, I used my drying rack this time and they dried out pretty quickly... still has kind of a chlorophyll taste. There are definitely hints of spice and pine but it just needs a bit of time to develop. It's quite potent and gives a nice uplifted, spacey high. Very happy overall! @BlackHatGenetics, I loved mine too, What an awesome strain! I have a whole lotta Mephisto on hand.. only one AvT left though. Looking forward to trying the new ones I have. @Squirrel_Master, i just chopped and dried 2x SODK and have 2x Sour Crinkle by them going right now too. I love their strains.